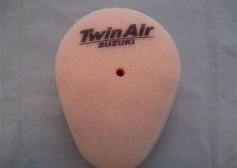 Applications: Suzuki DR650 ’96 – present Manufacturer: Twin Air MMP P/N: 10072………………………………….$29.95 $24 while supplies last Constructed from two layer of high-flow open-pore foam. Maximum filtration and superior air flow. 25% increase in air-flow while reducing tendency to clog. 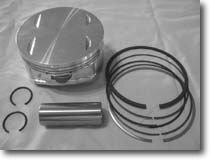 Applications: Suzuki DR650 ’96 – Present Manufacture: NGK MMP P/N: 10070……………………………………..$7.50 Pair These eventually break down and should be replaced periodically to ensure the optimal ignition performance. 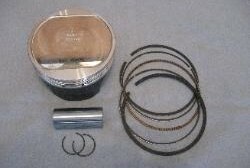 Sold in pairs for twin plug DR650s. 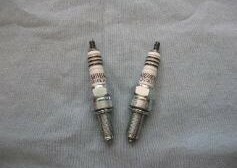 Applications: Suzuki DR650 ’96 – Present Manufacture: NGK MFG P/N: CR10EIX MMP P/N: 10071-1……………………………………$18.50 Pair These Iridium spark plugs require less voltage to spark, burn fuel more efficiently and spark at leaner air/fuel mixtures. Sold in pairs. 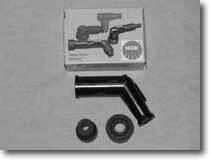 Applications: Suzuki DR650 ’96 – Present Manufacture: NGK MFG P/N: CR10EK MMP P/N: 10071…..…………………………………..$16.00 Pair NGK CR10EK multi-ground spark plugs for late model DR650 twin plug heads. Sold in pairs. 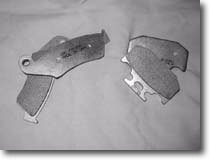 Application: Suzuki DR650 ’96-Present EBC FA185R Front Brake Pads – P/N: 10055….. $32.00 $30 while supplies last EBC FA152R Rear Brake Pads – P/N: 10054…… $31.50 $30 while supplies last Manufacture: EBC MMP P/N: (see above) EBC Long Life sintered “R” pads give reasonable pad life and good braking in all riding conditions, wet, dry, hot or cold.